I have just joined particularly to get a good activity calendar / schedule. How do i get to see or copy one of these templates? Nothing is opening when I click on an image, print or download only gives me a picture of the whole page. Thanks for your email. Some of these calendars have been sent in as pictures only, some as publisher files or word documents. If there is one in particular you would like to access, let me know and I can look up what original format we received it in and send this through to you. there were calendar templates that I have used for April and May that had nice pictures on the bottom. I could choose M-Fri and different formats. I cannot find it on the site anymore. Maybe I forgot where they were hiding? Anyone know what I am talking about? Perhaps you mean on this page? There are 12 months worth of calendars available in different formats. Hi. Can I also get copies of activities calenders on my e-mail ? Thanks. Where do you get the template to fill in your activities? The ones on this page were supplied in a variety of different formats. Is there one in particular you are interested in? Let me know and I can send you a copy. Hi everyone, I am about to start a new program for our lower care residents and sun downing residents. I was wondering if anyone has any suggestions for some activities that I could start with. If you post your comment in the forum next time everyone will see it! Thank you for posting these calendar's they are fabulous. Is there a way to copy these and edit for use in my work place. They have been supplied in a variety of different formats, some in publisher, some in word etc. Let me know which one(s) you are interested in and I will email you files as they were supplied. Sharing some of our monthly activities! Thank you for sharing Marialda! Thanks to all for sharing your ideas and experiences And Golden carers. Here is our "Day Respite" program for May. We have Mon-Fri respite and extended programs for our more mobile/independent clients as well as a social group of ID clients (of all ages). Hi, I find it hard to fit all our activities on our program as our program is open to the whole 90 bed facility. We can have 3-4 activities in the morning and the same again in the afternoon so we are full on. Our shifts are from 9am-5pm though. Thank you for sharing am going to play with a couple of layouts to do our weekly program. but I suppose it looks pretty with lots of graphics and pictures , do you think this is preferred , I also keep regular activities so people know when something is on by habit , and that goes for my volunteers and other staff . we are all creatures of habits and regularities , this helps for those that are easily confused . hahah including me . How great all this monthly and weekly calendars are...! Golden cares you are the best as a team work. this is a copy of our monthly and weekly program as well as each moth we send out a summary of the big thingd happening in month on the back of the weekly program. Here's our weekly one, I have a 5 week rolling template for activity schedules and about mid month we have a meeting and adjust or change activities for the next month. We print them on A3 and put up on notice boards throughout the centre for viewing weekly. We also write on the whiteboard in dining rooms of each days activities. Hope this helps. Can someone post a 7 day week (Mon - Sun) Monthly calendar template. I already have my Mon to Friday program, but we are now going to Mon - Sun & I am having trouble making it fit in. Thank you Loreta, I really like your program. This has given me some ideas on how to improve on my own. Thank you Talita. I tried to changed my activity monthly as much as I can so Residents will not get bored. Is anyone can suggest here where I can get the chair exercises for elderly for reasonable price. I had 2 dvd's running for one year now and I couldnt find any cheaper. You know our budget are very limited. Trudy 28th Jan 2016 CQI & Education Co-ord. Our visiting phsiotherapist devised exercises for the residents and spoke the instructions of each exercise as hse recorded them on a CD. Lucky for us her husband is a music teacher so he played the music to them all old time and the residents love it. When I worked with dementia residents they would do the exercises and sing a long. Just an idea if you could get someone to make a CD for you. Thank you Trudy that sounds like a fabulous idea. Thanks for sharing this Loreta - your activity calendar looks fantastic! 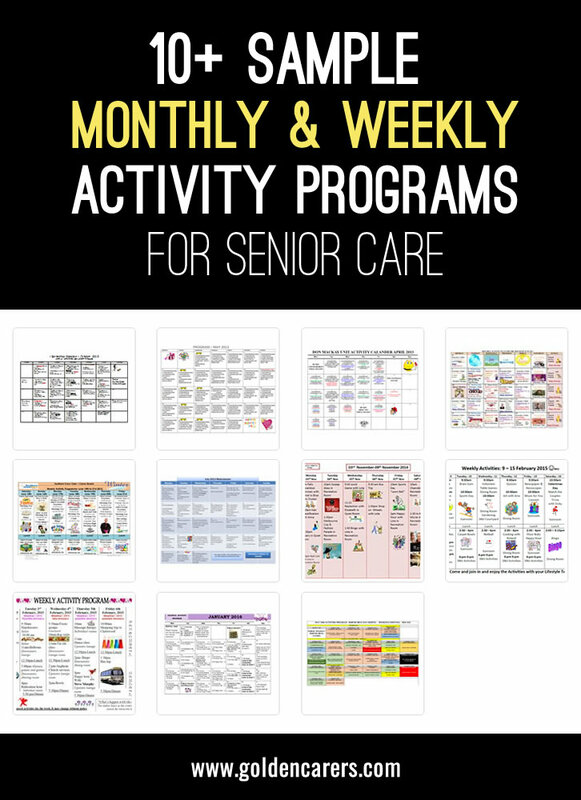 This is my latest program for our dementia unit *** see downloads ***. All residents have a copy in their rooms and an A3 size is also displayed in the main living areas. I try to make it visually interesting. Hope it helps. I'm lucky i have good team support as i am fairly new to RAO and have not done the course as yet. I am one of those 'newbies' and am having trouble keeping everyone happy especially the powers that be. This should help. Thank- you so much,I have had headache creating a calender to please our ILU's,this should do it. Thank you Sandra i have ajusted a few of my days to have a few more activities. Thank you Sandra! This is a wonderful resource for planning ahead.